After his latest trip to Las Vegas, TPG Points & Miles Editor Peter Rothbart shares his list of well-known eateries and hidden gems that you can bank on for a memorable meal. It’s often said that Vegas has something for everyone, and that’s definitely true for anyone with a hearty appetite. The Strip is jam-packed with places to eat, and with so much competition to bring diners through the door, there’s a lot of turnover. There’s a steady stream of new options, and most of them are probably worth trying. However, if you don’t want to gamble on your next meal, the restaurants on this list are sure to please. 1. Hash House a go go — If you’re on a diet, then this is not the place for you. Hash House a go go proudly embraces the go big or go home mantra of Las Vegas by serving up gargantuan helpings of creatively twisted farm food. Massively overstacked sandwiches, pancakes the size of a frisbee, and indecently large desserts are all on the menu. My personal recommendation is the Original Hash House Farm Benedict; if you can finish the whole thing by yourself, you’ll have earned both my respect and my condolences. Bring a friend and show up hungry. Location: If you’re on the Strip, go to the one in the newly renovated LINQ (just north of The Flamingo); enter through O’Shea’s Casino and look for a staircase in front of you and to the right. The downtown location is in The Plaza at the west end of Fremont Street. Prices: Most meals are around $12-15, many of which can easily feed two people. Pro tip: The LINQ location gets packed around brunch time (expect to wait 30 minutes to an hour), so put your name in early. However, Total Rewards Diamond elites can skip the line, so if you’re a FoundersCard member, be sure to activate that benefit on your account. You can also get VIP access as a Starwood Platinum member, but only if you’ve registered for the SPG/Total Rewards partner program. Khao Soi, Musaman Curry and a first-rate glass of Thai Iced Tea from Lotus of Siam, which routinely ranks among the top Thai restaurants in the country. Hidden in a dumpy strip mall about one mile east of Las Vegas Boulevard, this restaurant’s surroundings belie its quality. Lotus of Siam is routinely ranked in Top 10 lists of US Thai restaurants, including praise from Gourmet magazine as the best Thai restaurant in North America. The menu features an extensive variety of both southern and northern Thai cuisine, along with a respectable wine list. While the decor is nothing special, the food lives up to its reputation. If you want to get off the beaten path, this makes a great pit stop on the way between the Strip and downtown. Location: Lotus of Siam is situated in the Village Square Commercial Center on East Sahara Avenue. On a map it doesn’t appear too far off the Strip, but trust me, you don’t want to walk there. It’s only about 5-10 minutes by car from the nearby SLS or Wynn. Prices: Most entrées are $10-20, with a few specials up to about $28. Pro tip: If you’re traveling by cab, call for a pick-up as you’re finishing your meal, because there won’t be any waiting nearby. How secret is Secret Pizza? This backroom, no frills joint earned its moniker simply by not having another one. There’s no official name, no website and no address; there is a phone, but the folks behind the counter coyly told me that they don’t bother answering it when the shop is busy. What it does have is a rotating ensemble of piping hot, mouth-watering pizza made fresh and served by the slice or by the pie, along with a few salad, beverage and dessert options. Open until 4am on weekdays and 5am on weekends, this is a great spot to satisfy late night cravings. There are a few bar stools and a small counter in the shop itself, or there’s plenty of seating in the lounge area outside. Location: Secret Pizza is on the 3rd floor of the Cosmopolitan. Head up the escalators near The Chandelier and look between Jaleo and Blue Ribbon Sushi for a dark hallway lined with old record covers. Thick tonkatsu ramen, seaweed salad, chicken katsu, White Oak Akashi (neat), and a killer watermelon lemonade. Ramen is a growing fad in the US, but this hip new establishment does way more than jump on the bandwagon. While hot soup might not be your first choice in the desert, you won’t regret it once you’ve had a taste of the delicious, inexpensive ramen here; take your pick of perfectly cooked noodles, broths and toppings, or try other Japanese standards like teriyaki and katsu. Then check out the extensive list of beers, wines, sakes, cocktails, and (of course) whiskeys, including Japanese, American and Scotch/Irish varieties. Situated near the heart of downtown Vegas, this definitely qualifies as off the Strip, but it’s well worth the journey north. Location: The front door is on Ogden Avenue between Las Vegas Boulevard and 6th Street, half way from El Cortez to Gold Spike. Prices: Small plates and sushi rolls around $5, ramen and rice bowls around $10, whiskeys from $10-20. Giada’s interior and stunning panoramic views of Caesar’s Palace, the Bellagio fountain and more. While Giada is substantially more expensive than most of the other venues on this list, it won’t break the bank. Both the food and the views are awesome: try well-crafted staples like pizza and pasta, or creative twists like the lemon pesto grilled cheese and sweet pea tortellini, all while watching the heart of the Strip pulsate around you outside. Even if you can’t find room for a full meal, it’s worth coming in for a cookie platter, tiramisu, or specialty espresso (or if your sweet tooth is plaguing you, all of the above). Despite being the product of a daytime TV chef, the restaurant avoids feeling chichi, and instead offers a genuine elegance that’s not always easy to find in Sin City. Location: Giada is inside The Cromwell at the northeast corner of Las Vegas Boulevard and Flamingo Road. You’ll find the escalators along the south wall toward the west end of the casino. Prices: Small plates and salads around $10-20, pastas around $30, entrées cover a wide range from about $35-80. Pro tip: Your chances of getting a walk-up table at dinner are slim, so make reservations well in advance. Request a window table for the best views. The (unusually quiet) exterior of the Vegas outpost of Shake Shack during a 110-degree lull. 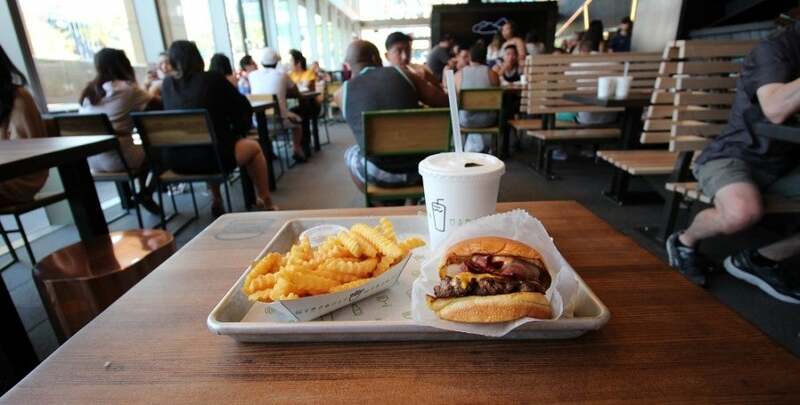 With restaurants in 11 states and the District of Columbia (plus several international locations), Shake Shack may already be on your radar. However, it makes this list anyway because it’s just that good. While it’s ostensibly fast food, you’d never guess so based on the quality. Shake Shack uses 100% vegetarian-fed, humanely raised and source-verified Angus beef with no hormones or antibiotics. The menu is simple (burgers, hot dogs, fries, shakes and beverages), but everything on it is consistently delicious. I’m not exaggerating when I say that the burgers and shakes are as good as any I’ve had, and they come at a very reasonable price. The only drawback is that since the front door is right on Las Vegas Boulevard, this place is pretty popular and the line is often long. However, it does move fairly quickly, so even when it’s out the door, you should be able to place an order within about 10 minutes. Location: You’ll find Shake Shack at the northeast corner of New York-New York; enter from outside the casino. Prices: Burgers from $5-10, shakes around $5, hot dogs, fries and most other menu items are under $5. Pro tip: You have to find your own seating, so if it’s busy and you’re there with friends, get one person to place the order and have the others lurk for vacant table space. See below for a few more dining options … when a burger, shake and fries just won’t do. Grand Lux Cafe (Two locations: one in Venetian and one in Palazzo) — Serving well-prepared American and Italian standards, this is a solid option for breakfast, lunch or dinner. Tequila Taqueria (Bally’s) — While it’s slightly overpriced, the food is good and it’s open until 6am every day, making it a great spot to wrap up (or further fuel) a night of Vegas mayhem. Stack (Mirage) — The food is good, but Stack makes this list for one simple reason: the Adult Tater Tots. Bacon and Brie … need I say more? Zoozacrackers Deli (Wynn) — The sandwiches here are impeccable, and with the sports book and poker room nearby, this is a great option if you’re looking for something quick during halftime or between hands. Firefly (Paradise Road) — It’s not Seville, but the tapas here taste pretty authentic, and the sangria hits the spot. What restaurants do you frequent in Vegas? Share your favorites in the comments below!